Summer around here means tending to the garden, pulling weeds, keeping everything watered and then waiting for everything to grow and ripen. It's that time so I've been busy canning. I wasn't quite sure I'd find a canning pot that would work with my induction top stove but I found this large size, stainless steel one at Walmart. Works like a charm. If you use an induction top stove, just make sure you see the induction compatible icon on the sticker. Then you'll know you're good to go. 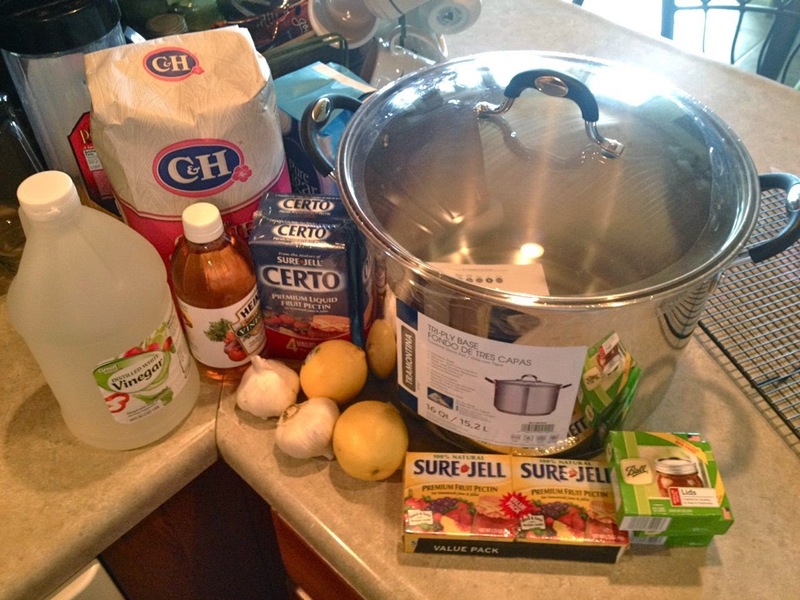 Good canning supplies and clean jars are a must. 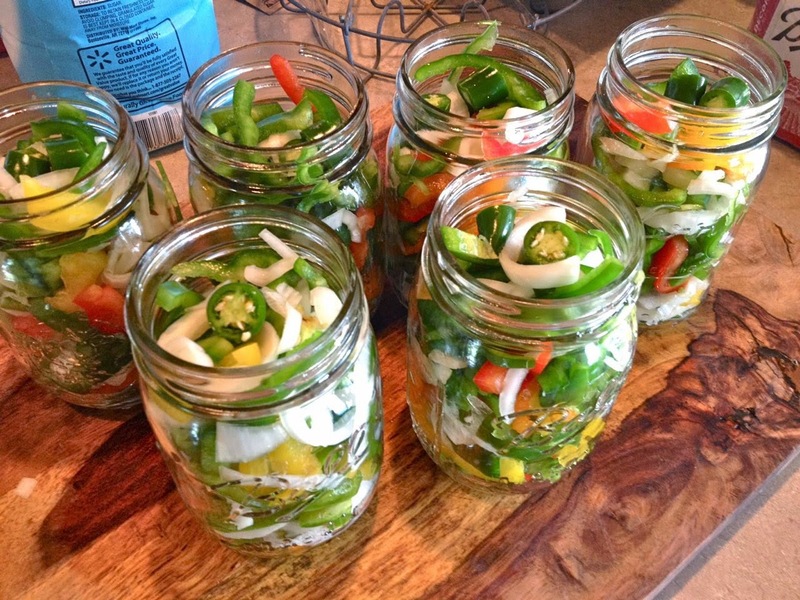 I use only sterilized jars that are meant for canning.....no mayonnaise jars or cleaned up pickle jars. Usually I stick with Ball or Kerr and Ball lids. 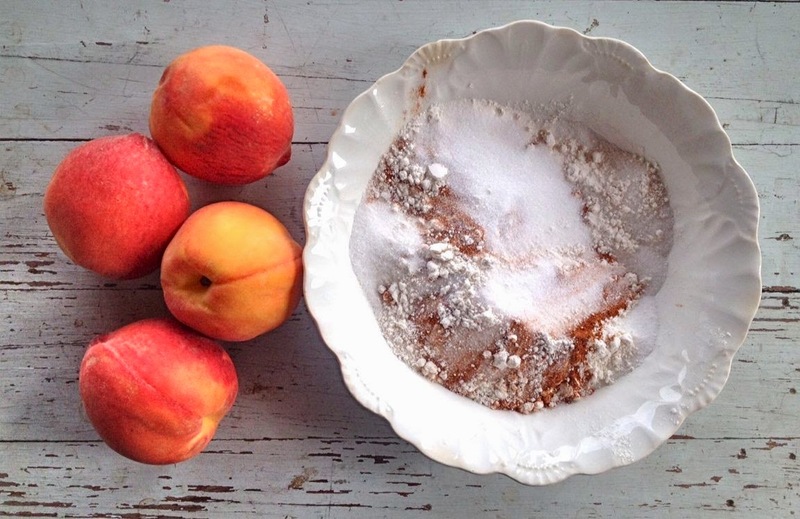 I like Certo Sure Jell for my liquid pectin but I tried the powdered version this Summer with good results too. There's always a little pan of simmering water ready to warm up the lids. This is key as it gets the rubber on the lids softened and makes for a perfect seal every time. First up was the fruits and Peach Jam. My local grocery store had some nice, ripe fruit this year that was really sweet. This is a favorite and probably reminds me of Summer the most come Winter time. Nothing like it on homemade biscuits. 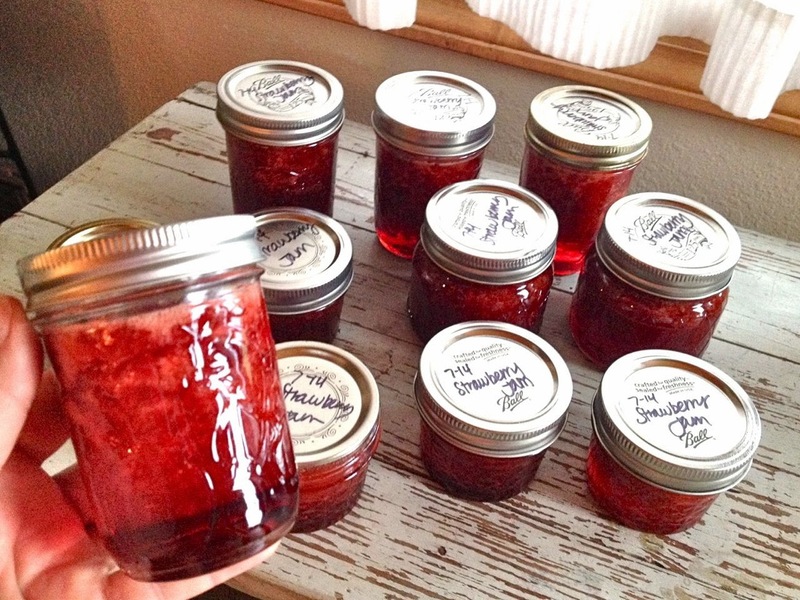 My mom always freezer Strawberry Jam but I opted to can mine. My jars ended up a little foamy but there was just too much to scrape off. Tastes just as good on some toast made from homemade bread. 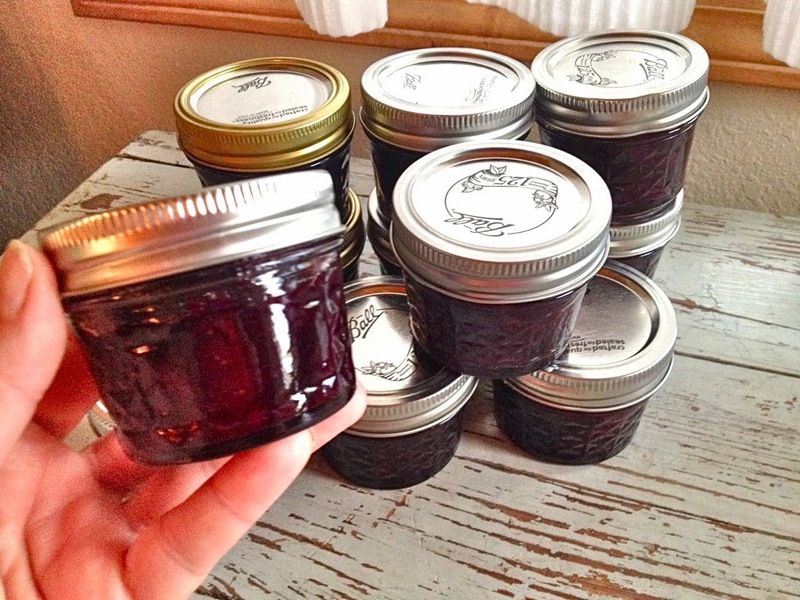 These little jars of Blueberry Peach Preserves will be yummy warmed up and poured over a bowl of vanilla ice cream....or over homemade yogurt with granola. 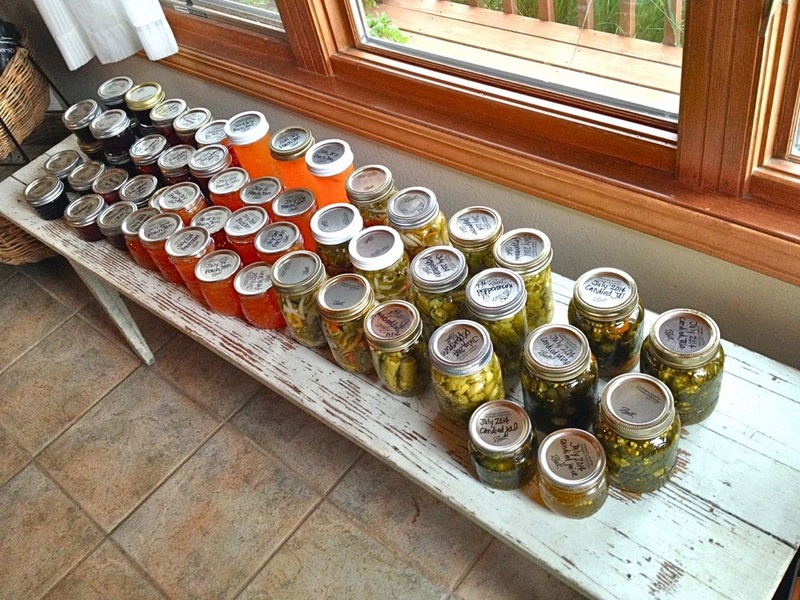 I spent two full days in the kitchen canning. Temperatures were very mild so I didn't mind heating up the kitchen for a while. 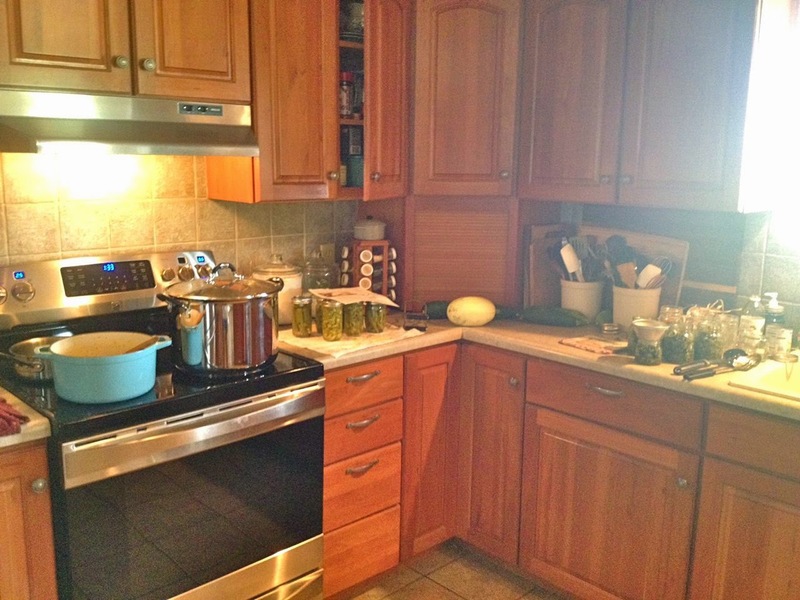 My kitchen usually looks like this during canning season. The stove is a boiling, sticky or bubbly mess, the countertops are lined with clean towels and cooling jars. 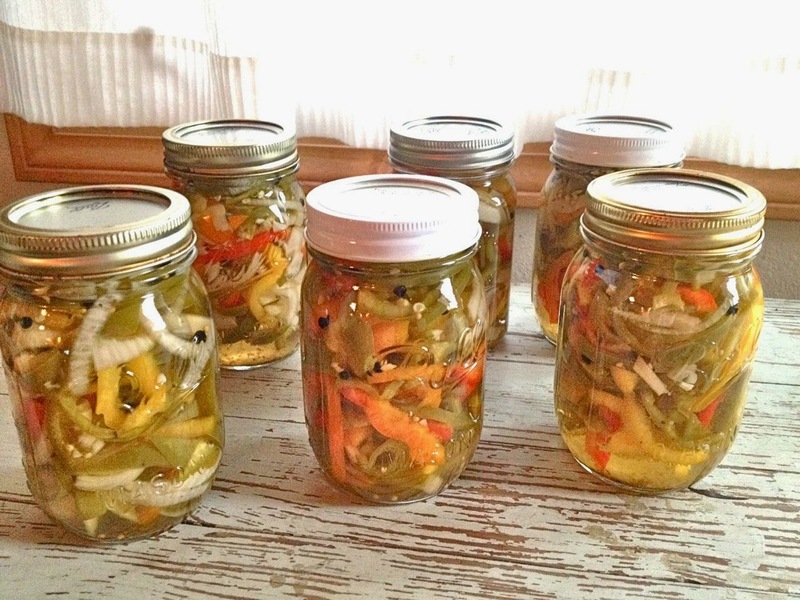 There's fresh picked zucchini, cucumbers and the like laying around....and there's always that wonderful sound to any canner's ears....the pop, pop, pop of sealing jars. 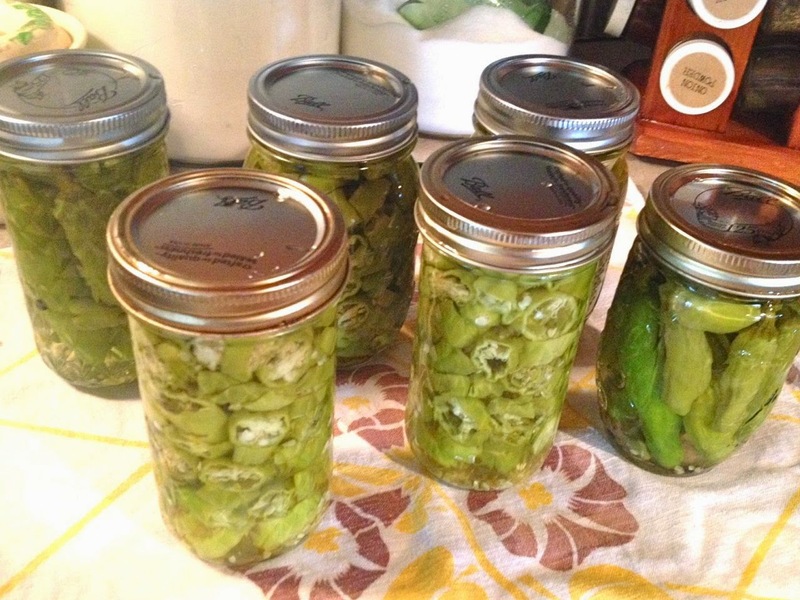 Next up I moved on to some sweet green peppers that I picked from the garden. I purchased the colored varieties at the store. 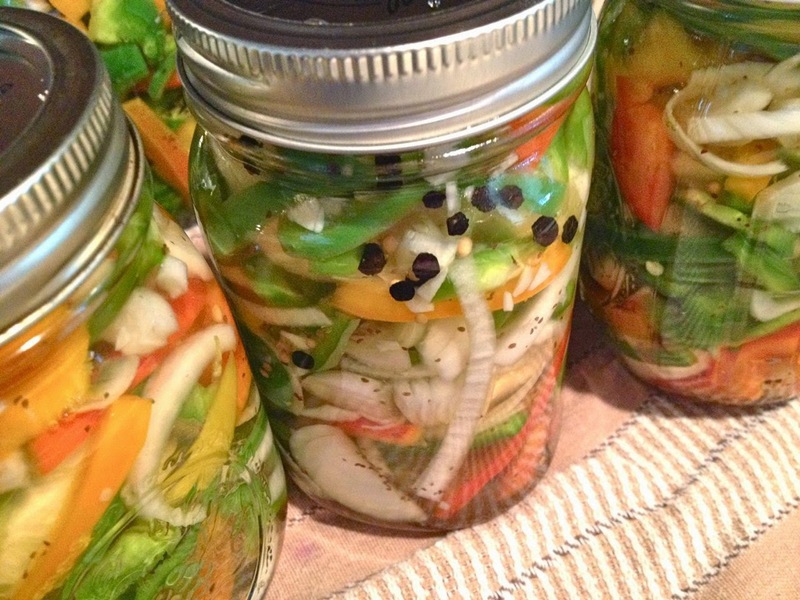 This beautiful mixture is Picked Peppers & Onions with a garlicky/peppery brine. 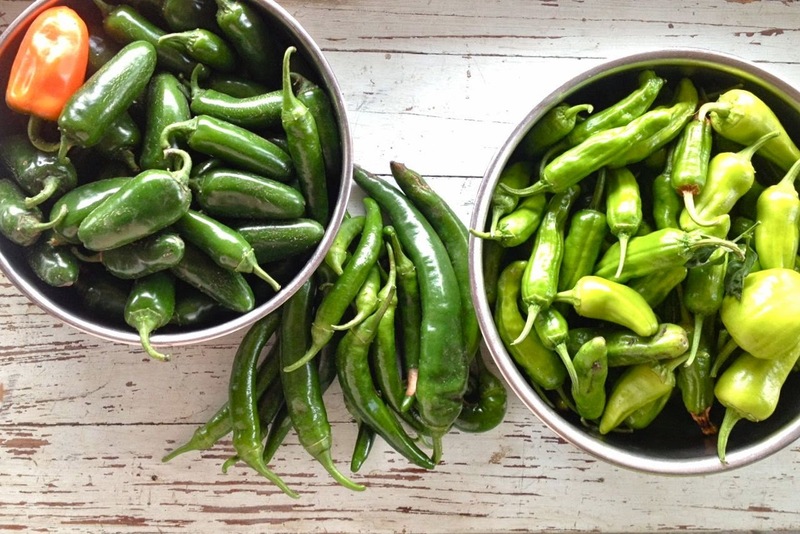 I added in a few jalapeno slices for a little heat. I plan to dump these over a roast, use on hamburgers or maybe mix some into some salads. Lots of possibilities here. Loved how these turned out straight from the canner. So bright and fresh looking. As always, the heat always turns the veggies a little muted color but these are still so pretty. I might even enter one of these in the fair this year....just to relive my 4-H days. Next I picked a variety of hot peppers from the garden. I was just about out of Candied Jalapenos. My family loves these over cream cheese with crackers, some dips and in Chili with a cool dollop of sour cream. These are more mild pepperoncini peppers. I sliced some and left some whole. 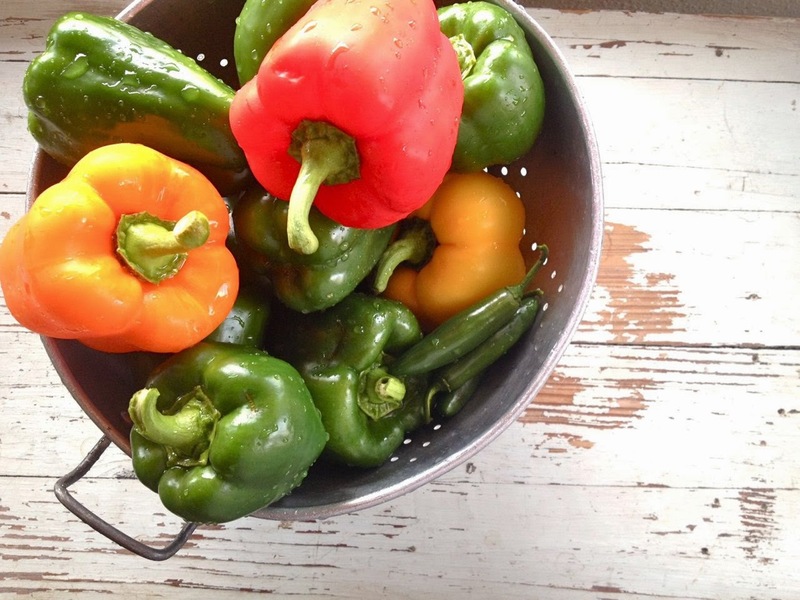 I'll use these over salads and will dump some over roasts in the slower cooker this Winter. That's my beautiful bounty so far. 55 jars of homemade goodness. 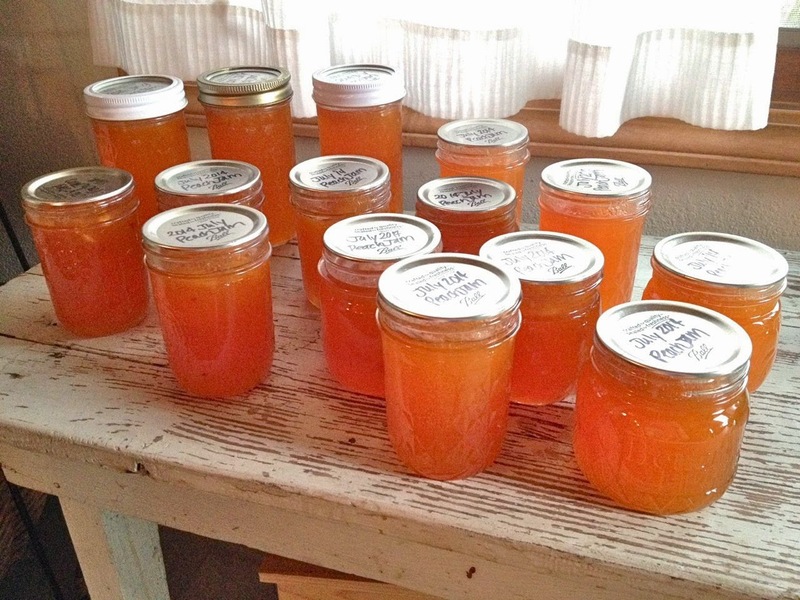 It feels so rewarding to grow your own garden goodies, preserve them in fun ways....and then reap the fruits of your labor come Fall and Winter. All the sweat and hard work pays off. 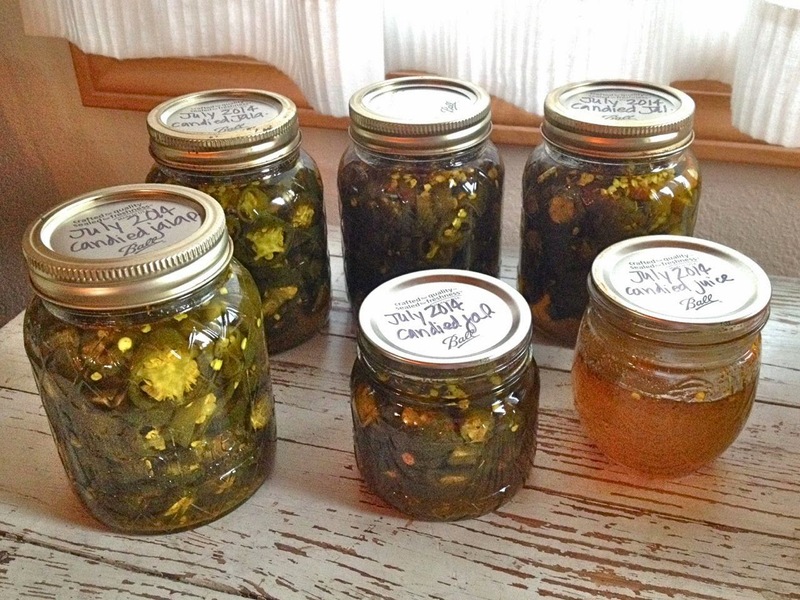 I have lots of veggies still in the garden so most likely I'll be canning up more jars for Christmas gifts this year. 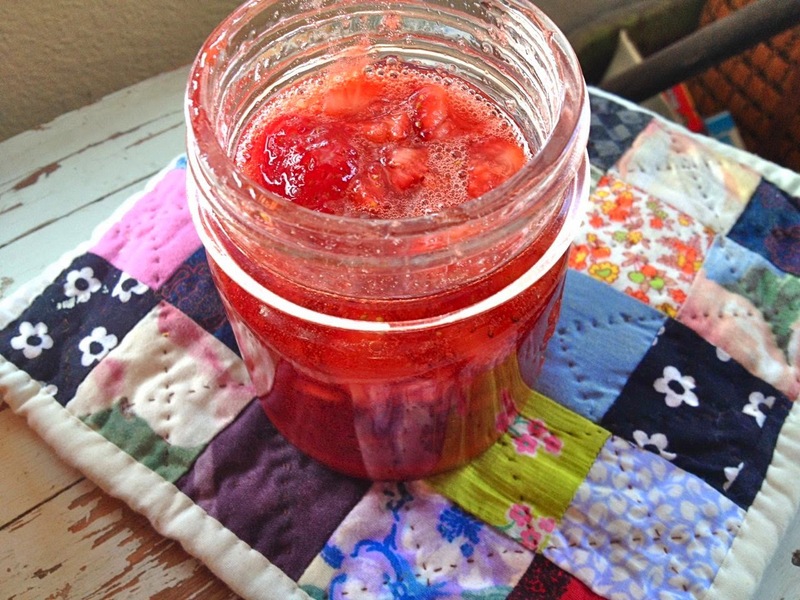 Haven't tried canning? Think it's too hard? It's not.....just get the right supplies, use fresh ingredients, follow the instructions exactly and you'll be on your way. Hope you give it a try and that we start a new canning revolution! 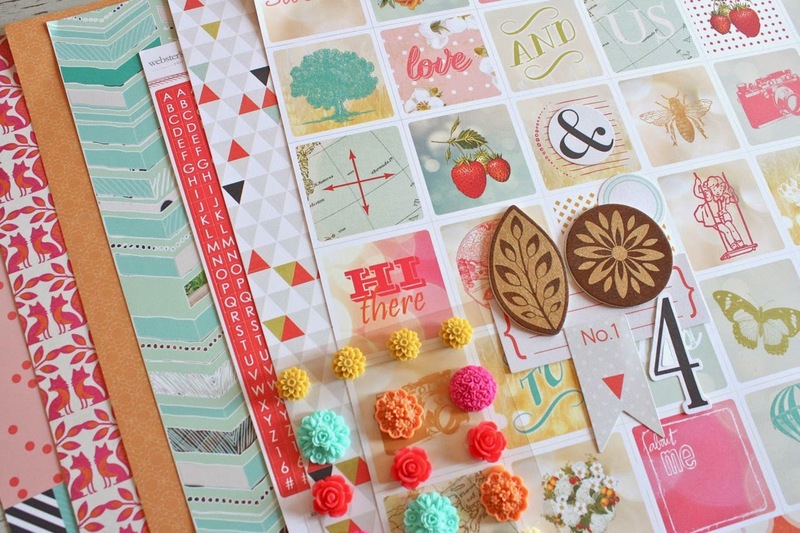 The August Main Scrapbooking Kit......I love the colors of the patterned papers, a great vellum sheet and awesome new printed cork shapes. I think the circle ones will work perfectly with the stamp set images. 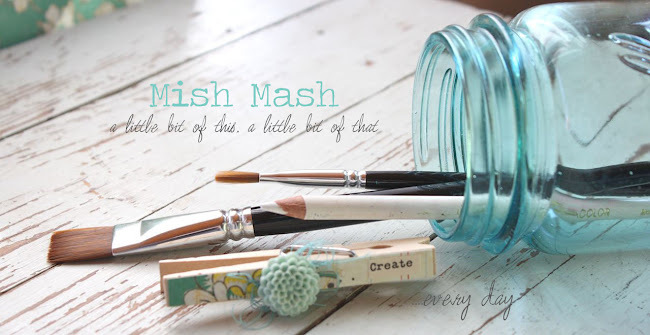 The August Main Add-On Kit....This one is a must have. 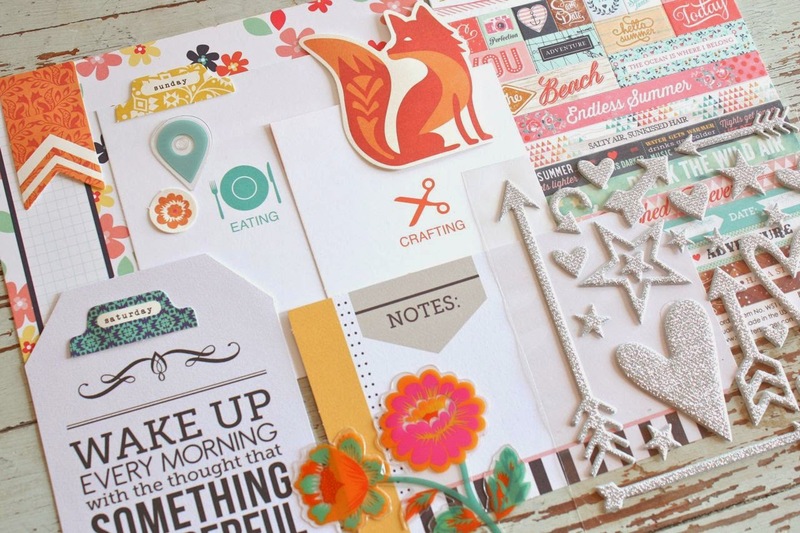 The patterned papers are delightful, just look at those strawberries and fox images. For embellishments, I'm loving the printed wood shapes and resin flowers. The August Main Add-On Kit #2...Webster's Pages makes its way into the kits this month. The colors and designs are fresh and new and so colorful. Check out the new metal embellishments. I can see these layered with threads and buttons. The Bits & Pieces Kit....This is always a fun one to open. 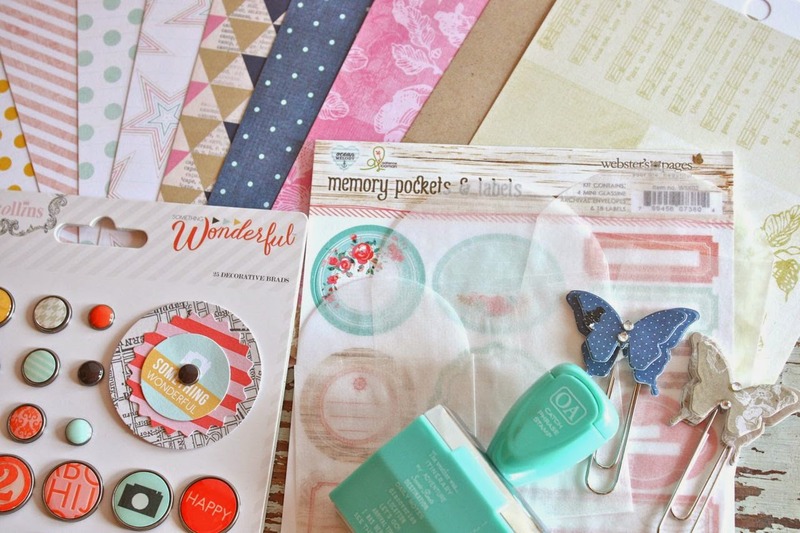 This month features a cute paper paper, stickers, brads and the oh so cute butterfly paperclips and October Afternoon roller stamp. 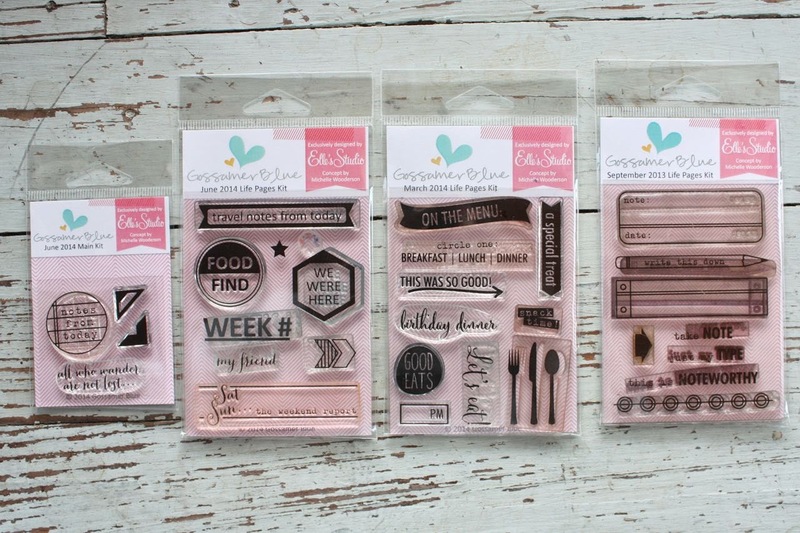 The Life Pages Main Kit.....You'll love the new printed cork shapes this month. I'm going to try them out with stapling and stitching onto some journaling cards. 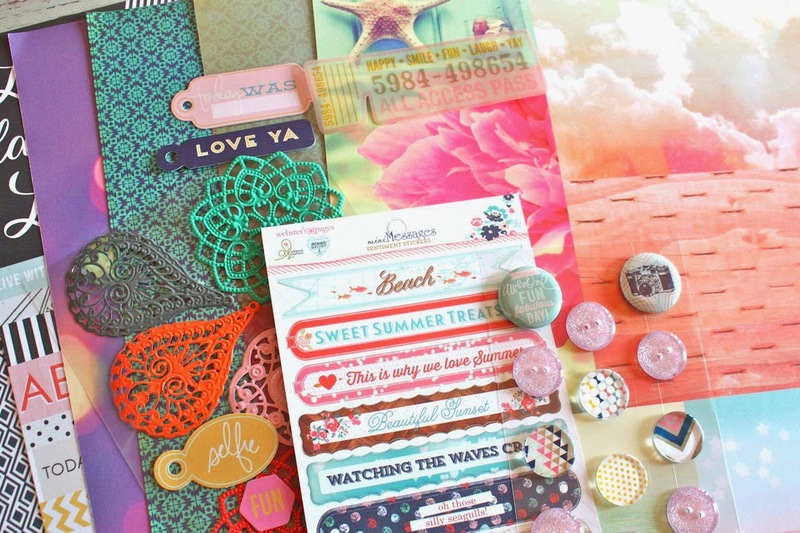 Take note that the circle stamps from this kit fit into the stamp in the Main Scrapbooking Kit. The journaling cards this month are extra fun too. 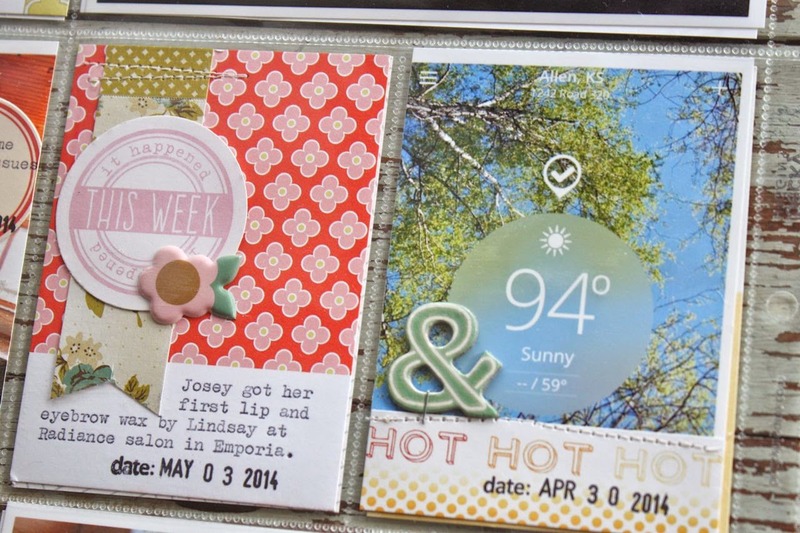 The Life Pages Main Add-on Kit........This one is a fave for sure. The colors and embellishments in this one are just too cute. Packed full of little embellishments. 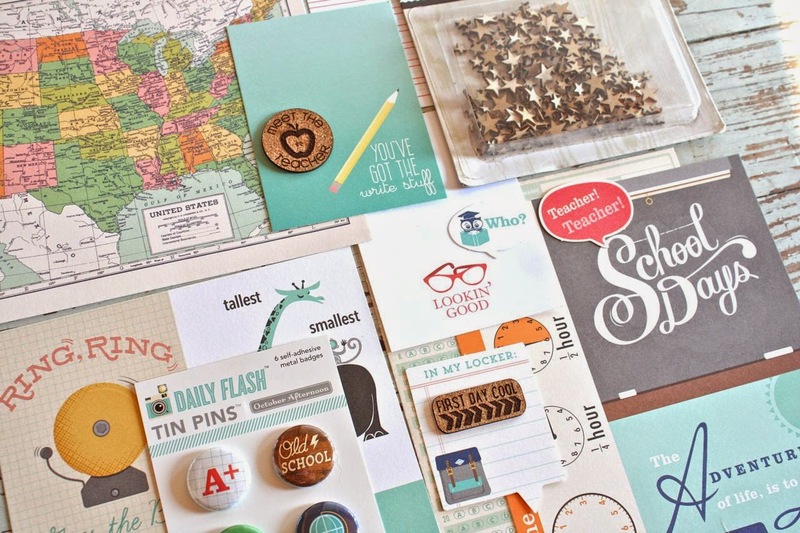 The Life Pages Themed Kit....Perfect for documenting school days. We are knee deep in Summer but I've got some May weeks to catch up on and this kit will be perfect for back to school photos. 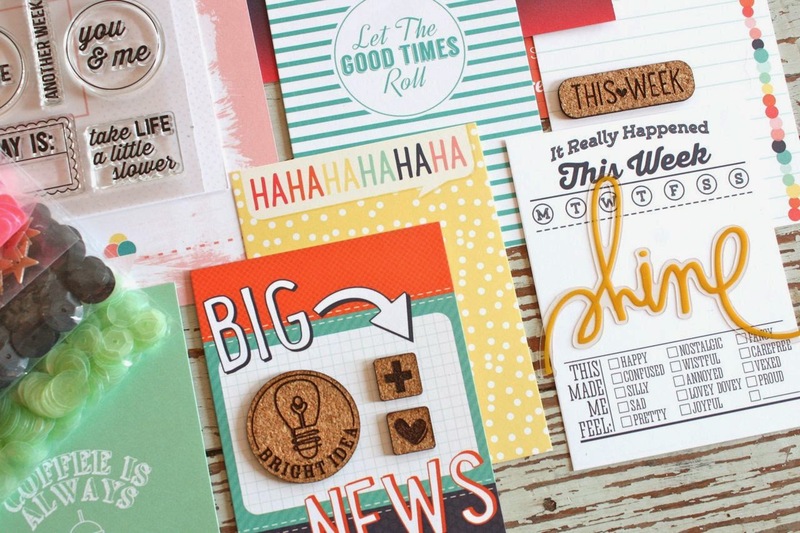 There are more of the printed cork, some fun October Afternoon printed sheets and the most adorable journaling cards. See those wood veneer stars? You just can't have too many of those. 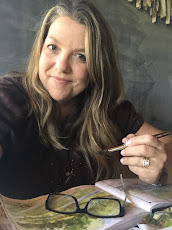 The Life Pages Add-on Kit #3...Awesome journaling cards, a new gold cut sheet and one of my favorites every time there's a new style...the Heidi Swapp adhesive notes. More of the cork pieces too, you'll love them! Can't wait to get to work with these kits. What do you think your favorites will be? 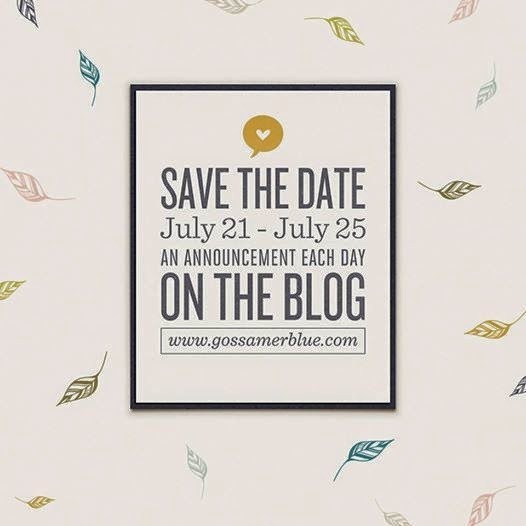 Check this out.....there will be new Gossamer Blue announcements coming soon. How exciting, right?! 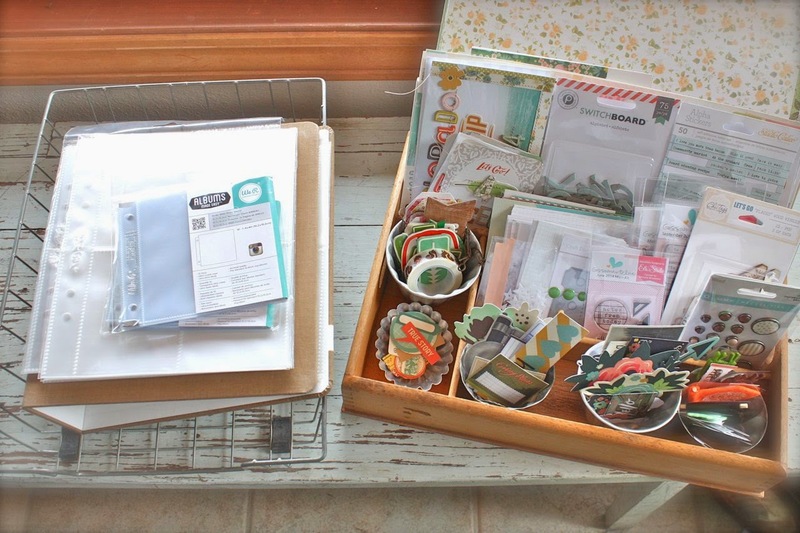 Hope your week is off to a crafty good start. I've got some catching up to do since vacation but stop back soon for a new post. 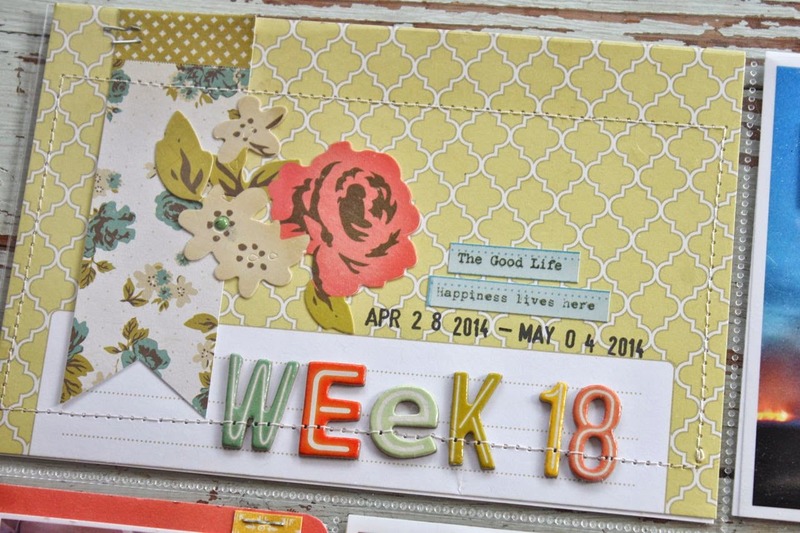 In my Week 17 Project Life spread I used products from just the July Gossamer Blue Life Pages Kit. 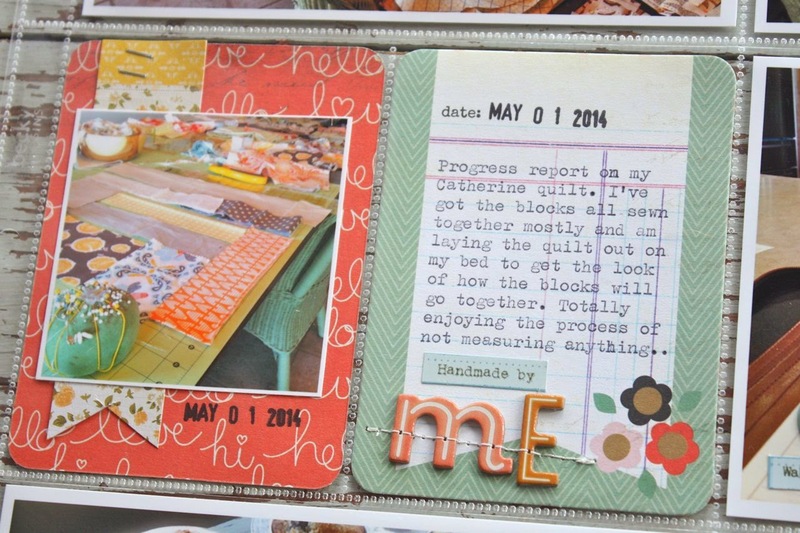 This week I'm sharing Week 18 of my Project Life 2014 & I'm mixing up the July Gossamer Blue kits. There's little bit of everything in this week + a few inserts. Here's the two page spread. Love the colors for this week. I always seem to find just the right mix from the Gossamer Blue kits to suit my likes. The left page. 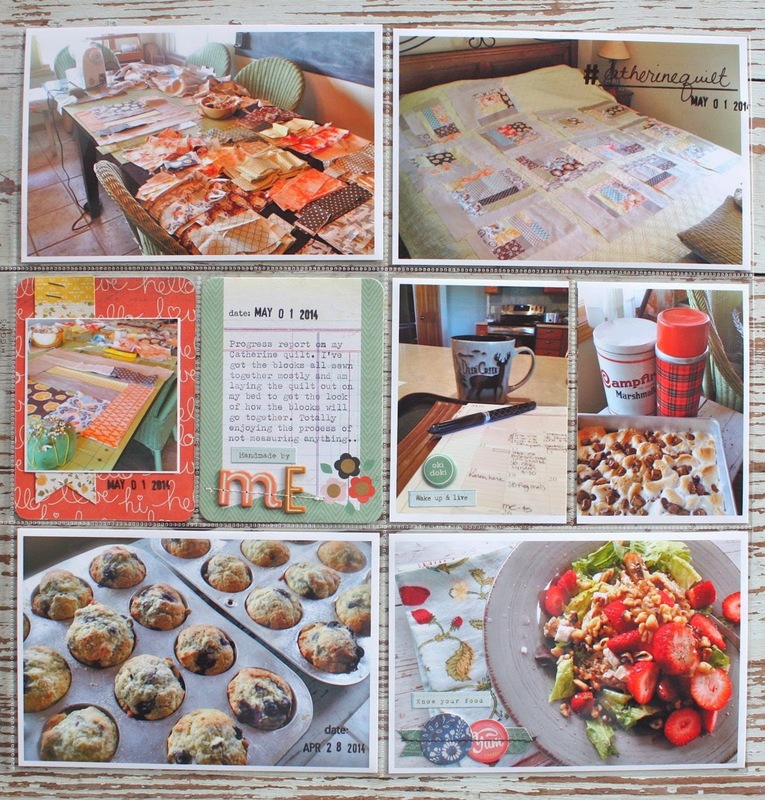 For this week I used lots of journaling cards from the July Life Pages Add-On 3 Kit. Love Peppermint's work and her subtle use of color and pattern. This is one of my recent favorite inserts. I love the greens and blues with the added oranges. 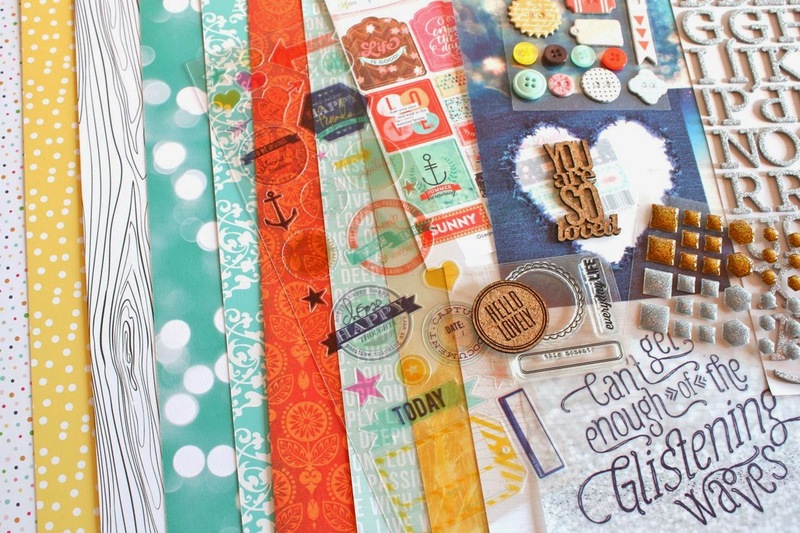 This chipboard alpha from the main July Main Kit is a favorite too. It's mixy matchy style just goes with anything, adding just a bit of whimsy. 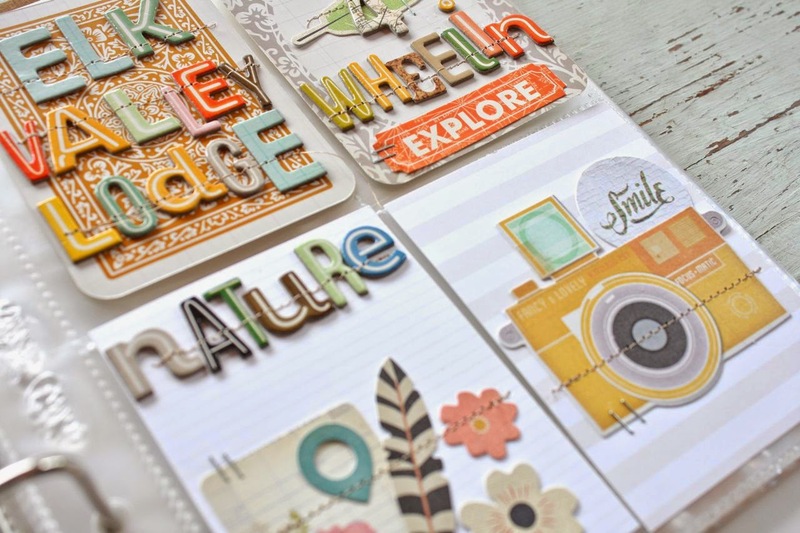 It's from the Open Road collection from Crate Paper called Mixed Letter Thickers. A number 4 from the alpha set + a stamp from the Main Kit. Stitched embellishment from Crate Paper + one of the Studio Calico phrase stickers from the Bits & Pieces Kit. 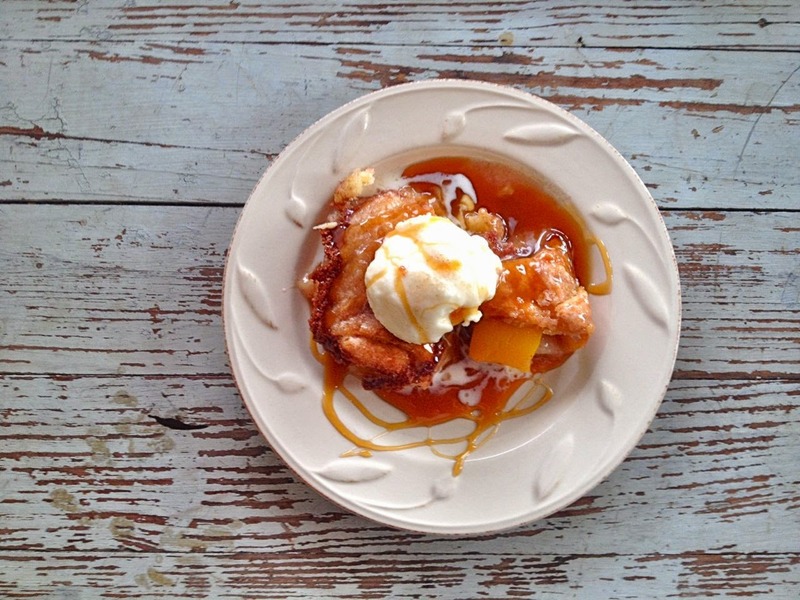 Do you add foodie type photos to your Project Life? I love taking closeup shots of plated food. It's fun to add in a few props like pretty plates and cloth napkins too. Just photos from the week with a few added embellishments. For the insert on the left, below, I used another One Little Bird journaling card as a base. I used Traci Reed's journaling card with the pink circle and punched out the circle. 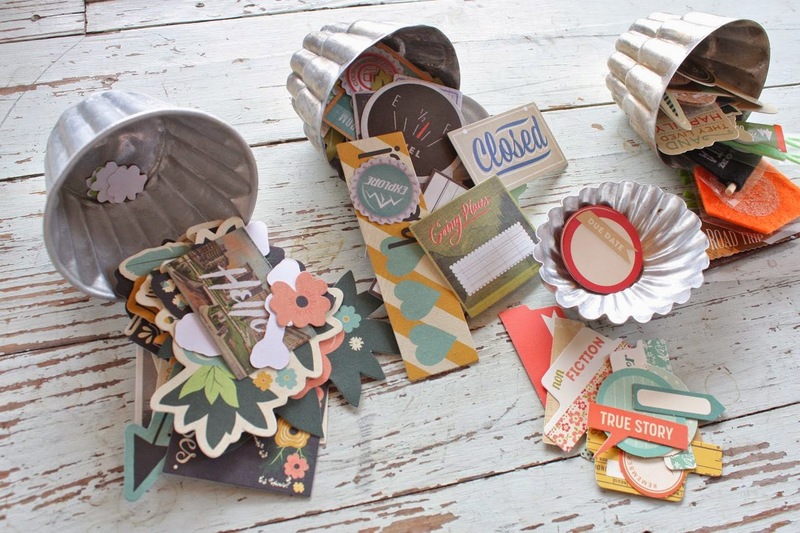 There's lots of creativity you can you add to the cards by manipulating them just a bit. That cute puffy flower sticker is from the July Main Kit. If you like cool ampersands then the Main Kit is for you. You must get the chipboard alpha, it's that good. On the right you can see one of the ampersands + I altered another journaling card by trimming off the bottom and stitching it to a photo. I trimmed lots of little notched flags from the 6 x 6 pad in the Bits & Pieces this month. On the right I used more of the chipboard alpha from the Main Kit. This week I had one insert with a front layout and separate back layout. The front features a day of planting the old chicken feeders. The photos were just so pretty...I had to use more than one. I created a little title insert using more hand cut, notched flags and embellishments from the kits. My back insert is a new favorite too. 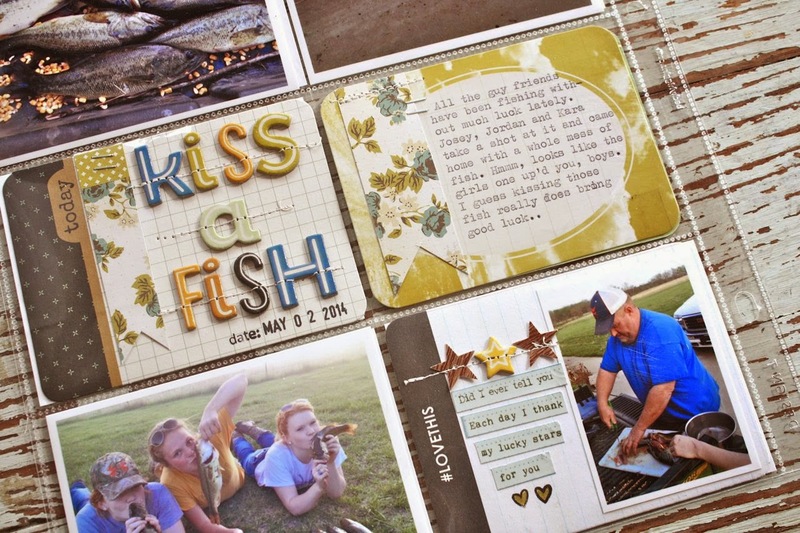 It features photos of my girls + a friend and their catch from fishing. Again, just too many photos to narrow down so I used quite a few. 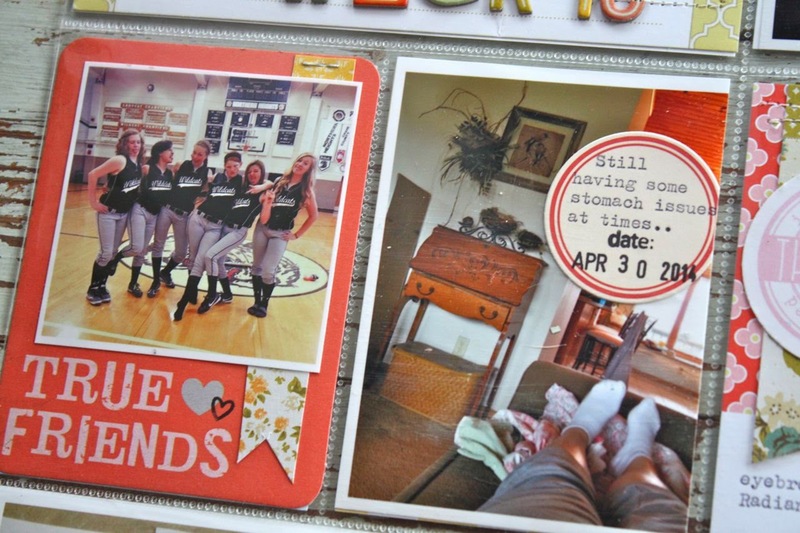 I've pretty much omitted 12 x 12, large size layouts from my scrapbooking. 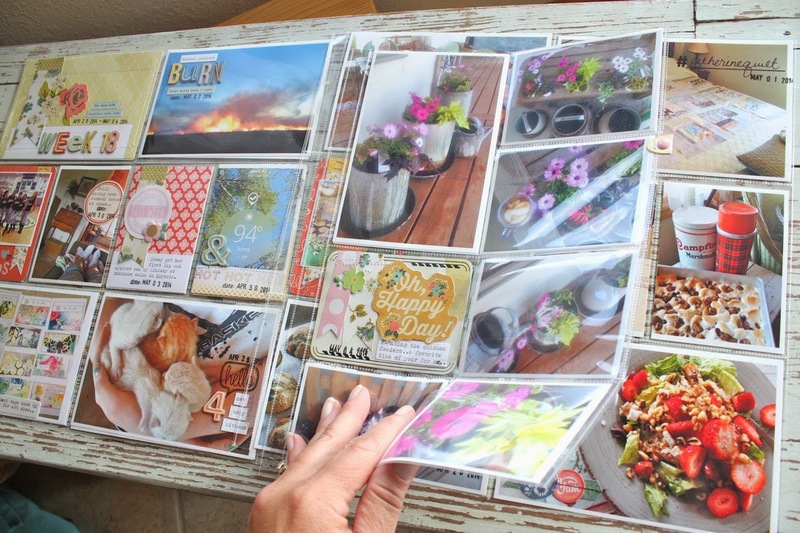 I just love using multiple photos and the Project Life divided page protectors make it easy to complete a large spread. Loveeee the inserts here. 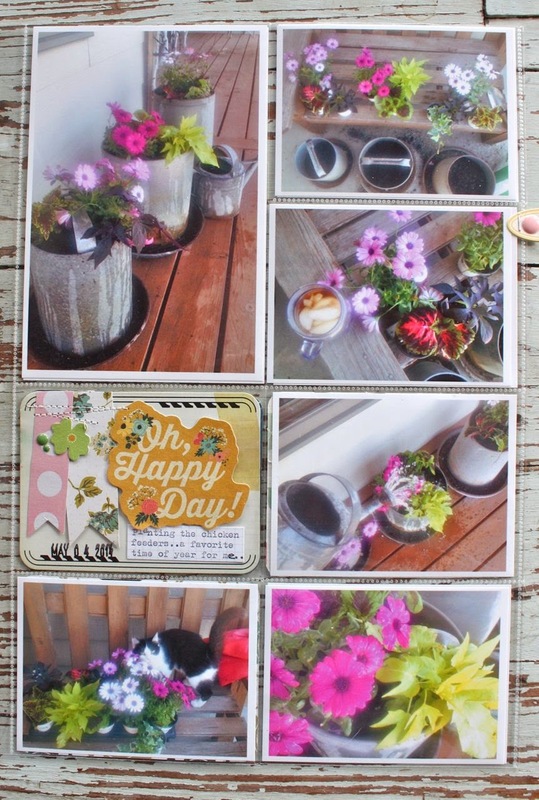 The colors and flowers and that quirky little alphabet just all plopped themselves down onto my 3 x 4 cards. I really love the little Studio Calico phrase sticker sheet from the Bits & Pieces kit and the Studio Calico wood grain star sequins from the July Main Add-On Kit looks so cute when paired with the chipboard star accent. A little machine stitching ensures the pieces will stay secured. 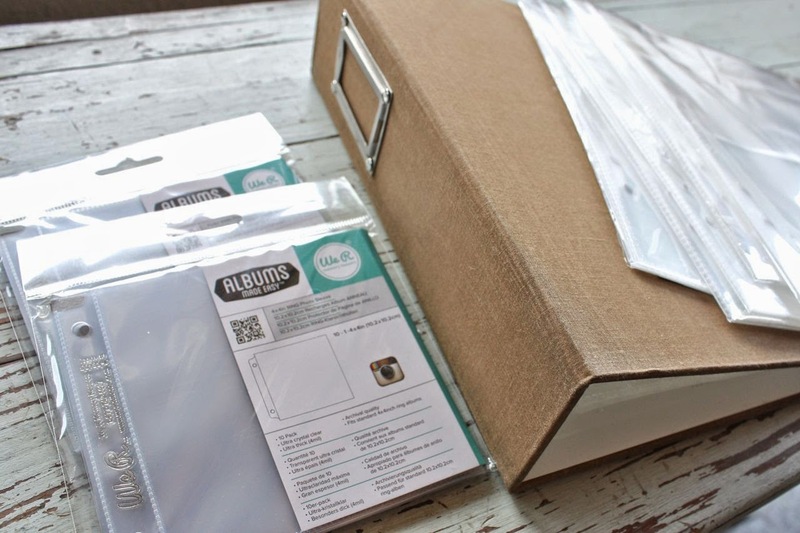 It's so fun to work with the Gossamer Blue kits for my Project Life. There's just such a great selection and it all coordinates so beautifully. I can't wait to use more of this kit and do some catching up on my weeks. Thanks for stopping by today! I was asked to bring a dessert to my sister's July 4th celebration. We always try to "bring it" when it comes to food in our family. 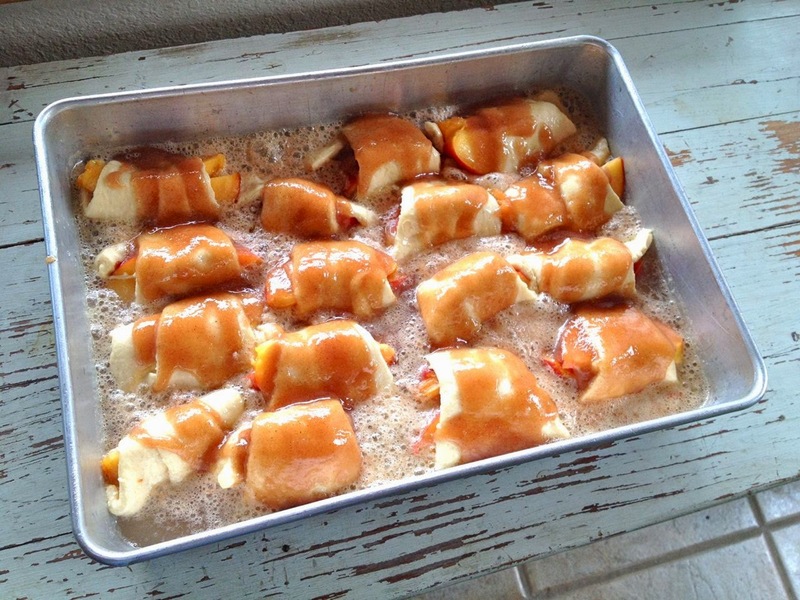 I thought something with peaches would be yummy so I found this awesome recipe for Peach Dumplings on Pinterest. It makes for a beautiful presentation aside from being quite delicious. 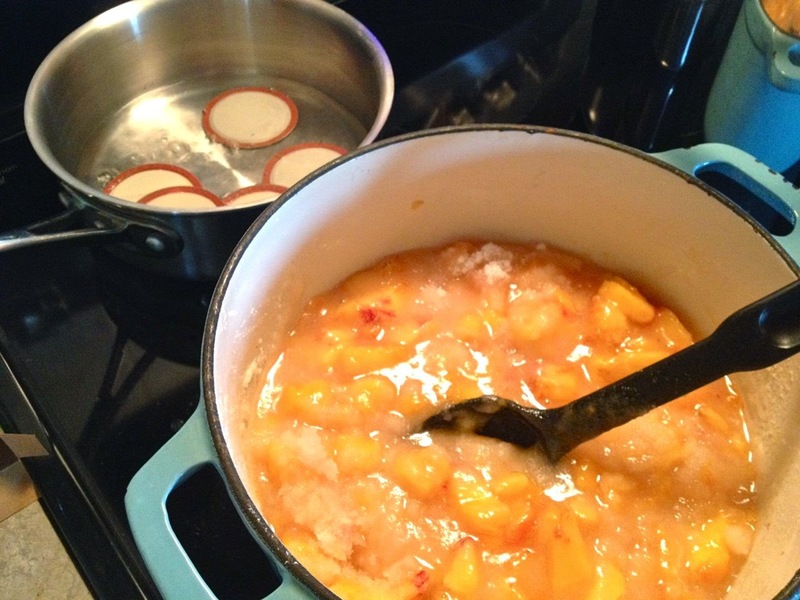 I prepared the recipe just as noted with the exception of using 2 peaches instead of one. I just cut two slices for each crescent roll. You start by mixing the dry ingredients with melted butter. I also doubled the recipe and used a 9 x 13 pan. 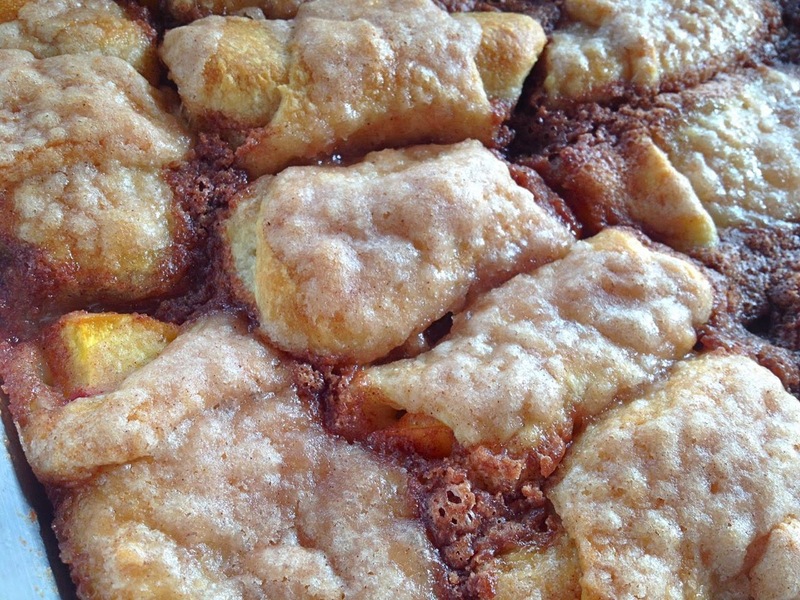 Here's the rolled up crescent rolls with peaches, the buttery crumb topping and a quirky ingredient, the 7 Up poured around the unbaked dumplings. 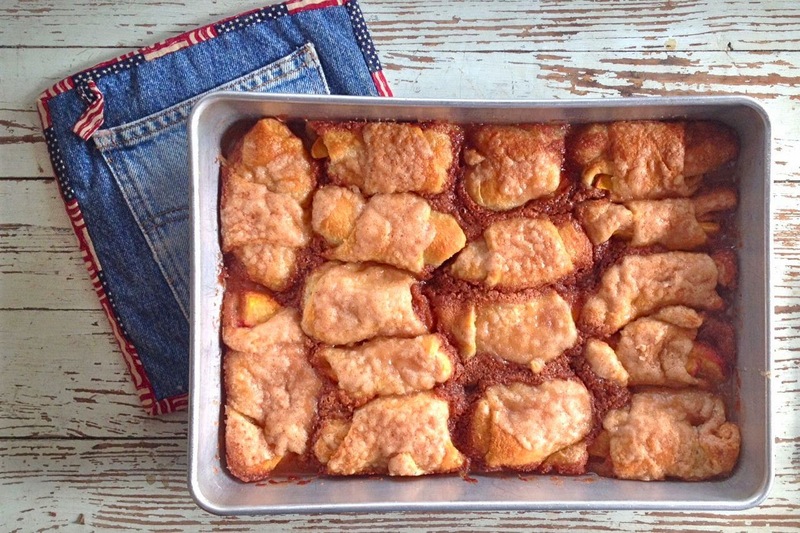 Pop them in the oven and wait for the magic to happen. The dumplings bake up so pretty and browned and bubbly. 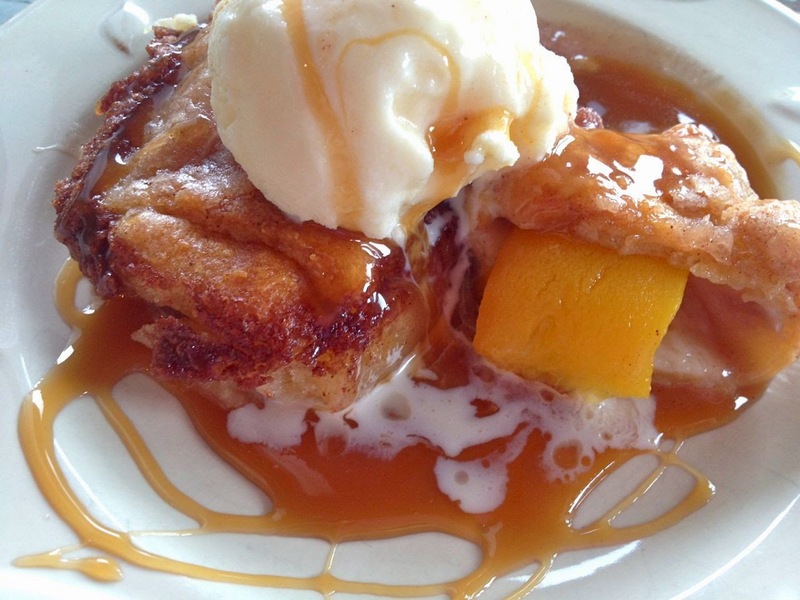 The peaches are nicely done and so juicy, with lots of cinnamon goodness all around them. 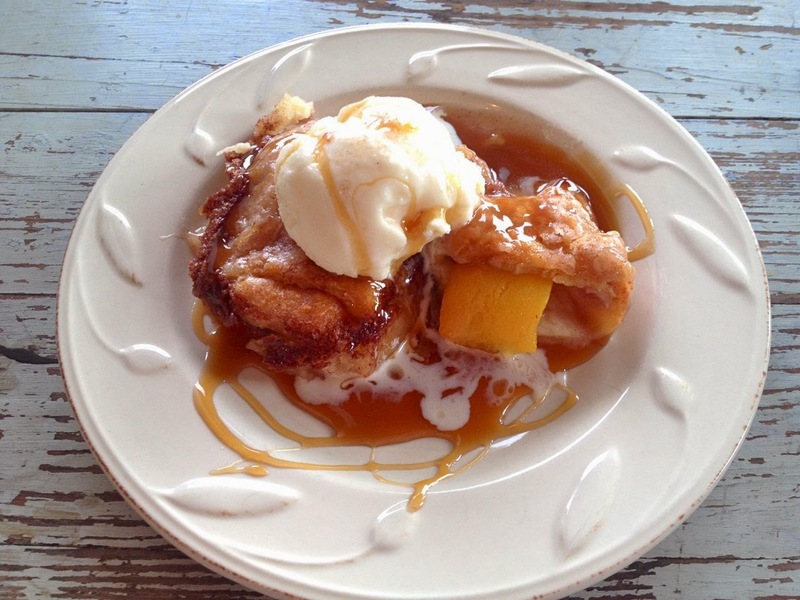 I served each dumpling with a scoop of my mom's homemade vanilla ice cream. It always gets raves reviews and is the best recipe I've tried for homemade ice cream. I also drizzled on some warm caramel sauce for a pretty presentation. The dumplings are warm and sweet and so delicious. You definitely get that homemade awesomeness when you serve these little yummies. They got rave reviews at the July 4th celebration so we're adding them to the "keeper" list of recipes. I hope you give them a try. My family + 3 other families are headed to Colorado soon for a fun Summer vacation. I've got the making of a mini album in progress so I thought I'd share my supplies that I have set aside for this project. 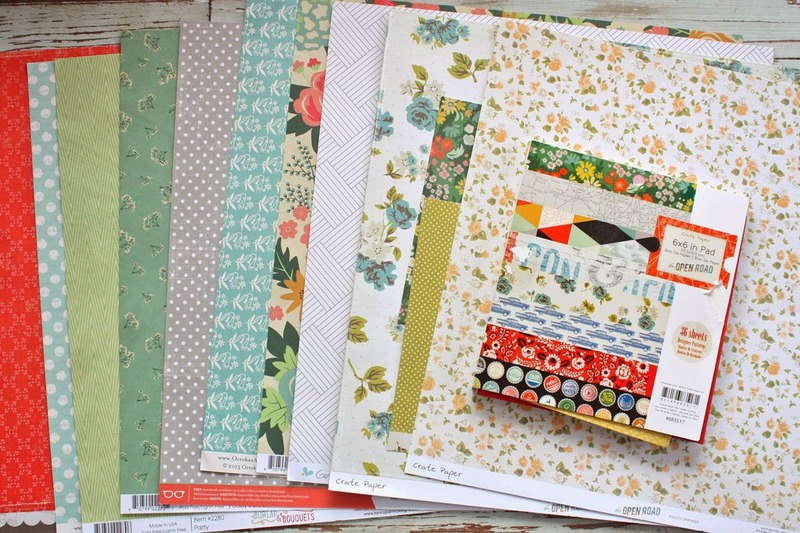 First up was this beautiful assortment of patterned papers. These come from all the various kits + the 6 x 6 Open Road Crate Paper pad from the July Bits & Pieces Kit. The sticker embellishments were right on track for my mini album. 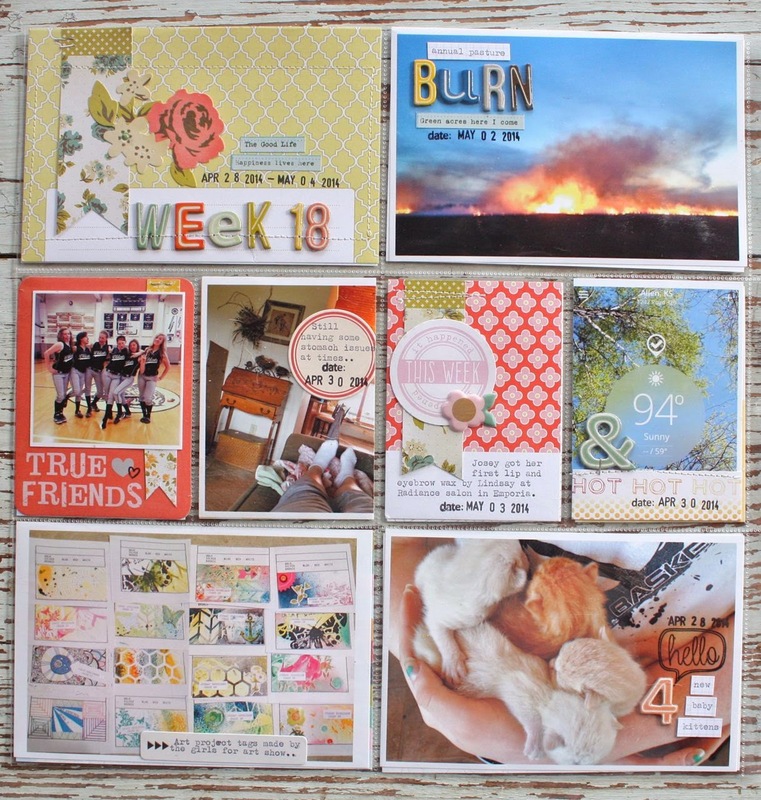 The chipboard alpha and October Afternoon label sheet is from the July Main Kit. 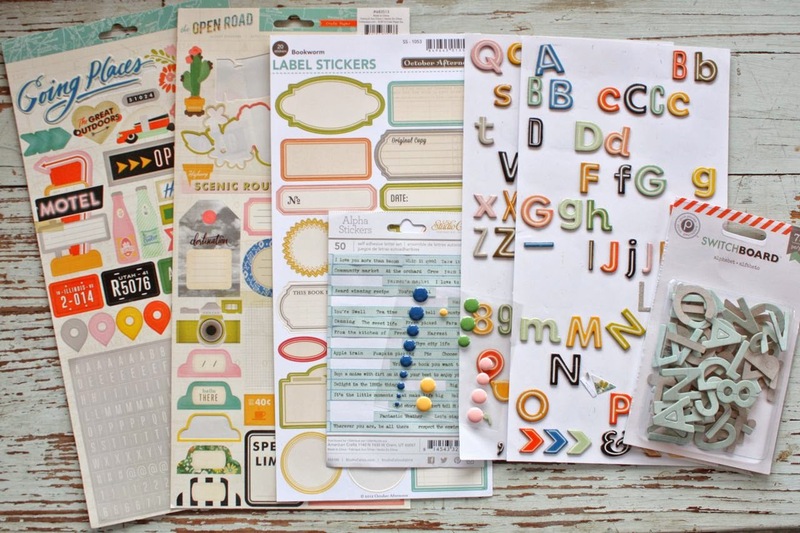 The Open Road stickers from Crate Paper are in the July Main Add-On Kit. The Studio Calico phrase sticker sheet is from the July Bits & Pieces Kit and the Pink Paislee Switchboard alpha is from the July Life Pages Add-On 3 Kit. 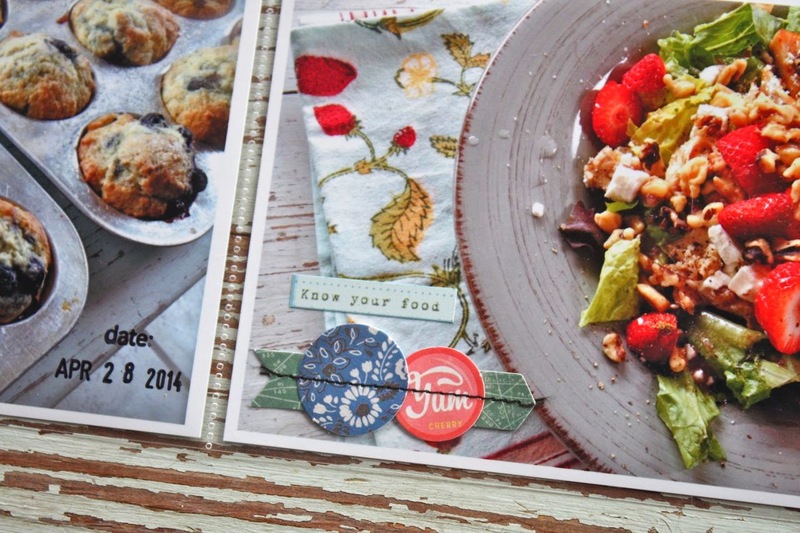 I dug through my stash of Gossamer Blue stamps, choosing sets that had travel and foodie images. 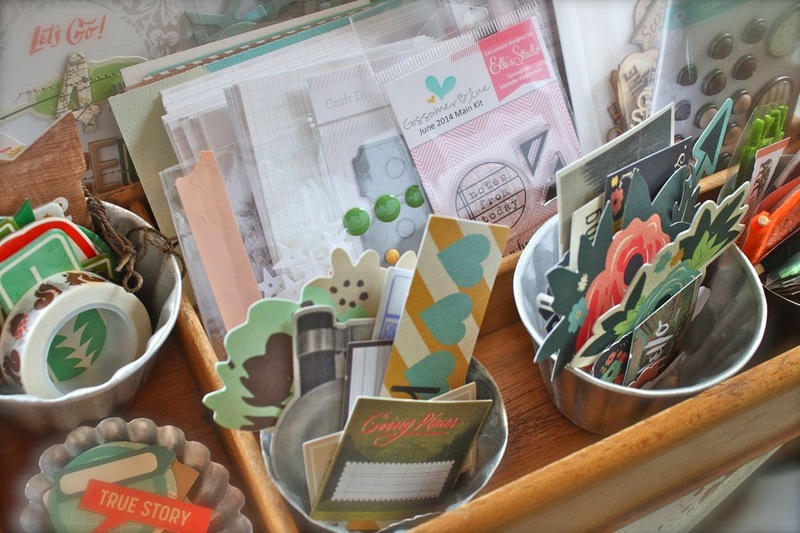 I have lots of little tins packed full of travel, floral and label images. These are tucked into the various July Gossamer Blue Kits. 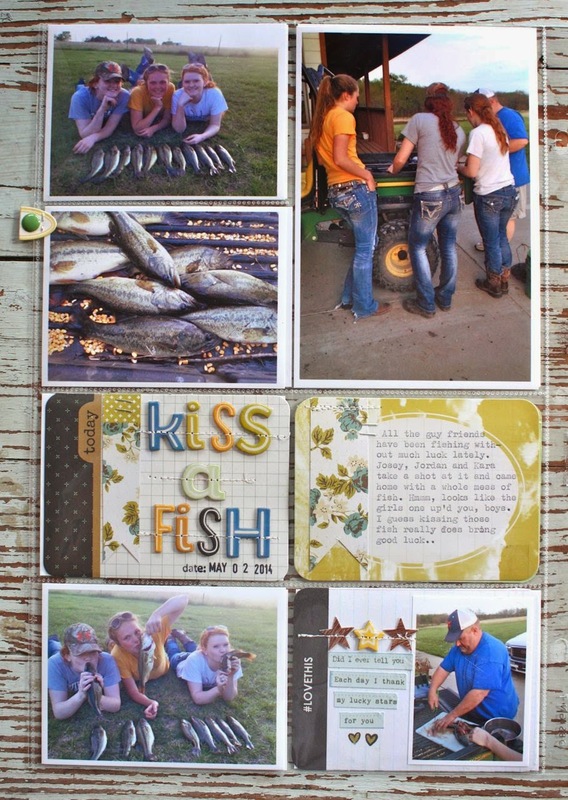 For my mini album, the Studio Calico Handbooks are becoming a favorite. I'll be using the Chocolate Handbook this time along with different size page protectors. A fun discovery is that the We R Memory Keepers 2 x 2 Photo Sleeves and the 4 x 4 Photo Sleeves fit the rings of the Hand Books. I'll also be trimming some other Project Life page protectors down I'm sure. I love mini albums to have lots of different size page protectors and things like pockets, etc. 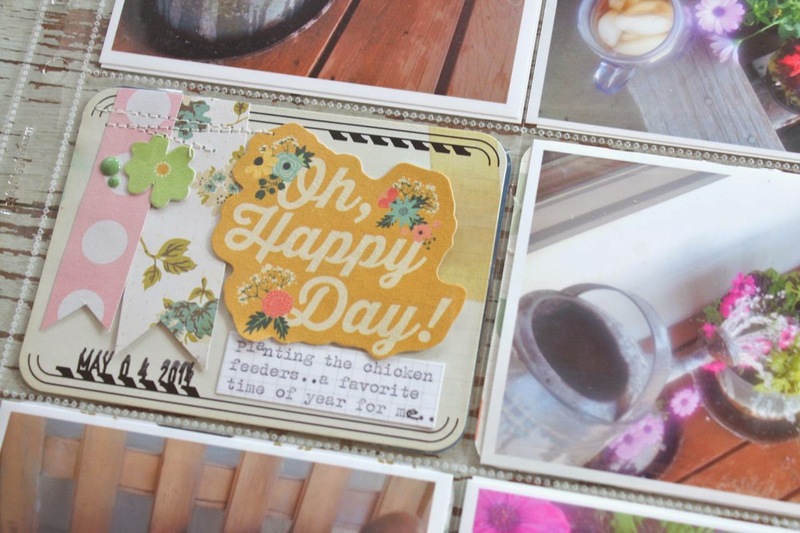 I really love the Crate Paper Open Road Journaling Cards that are included in the July Gossamer Blue Life Pages Main Add-On Kit. 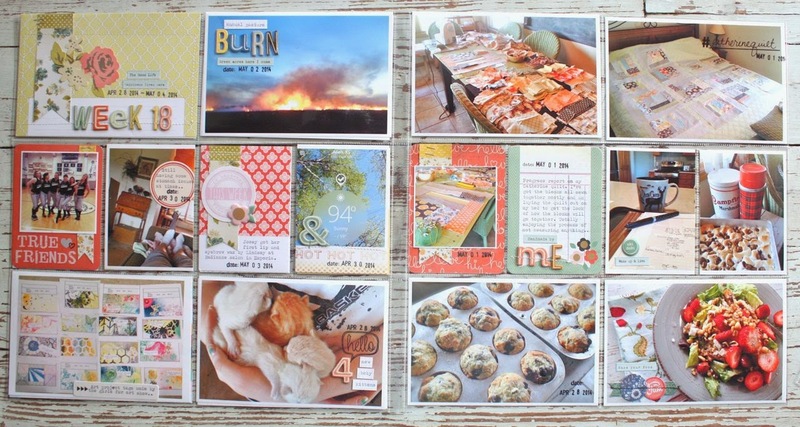 I'll pair them with other GB journaling cards and ones that I create on my own for some fun title cards. You can see a peek of some title cards I created in advance. I love the feel of this album....lots of muted nature colors, some quirky alphabets like what you might see on old hotel signs with the big arrows pointing to the hotels and snippets of road trip and nature themed embellishments. 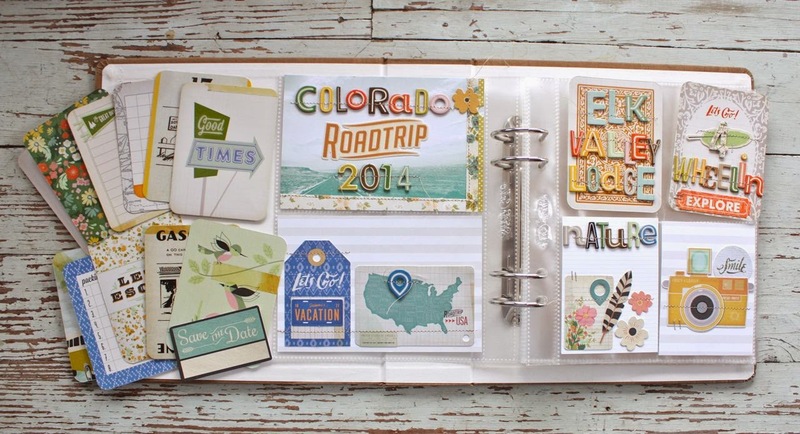 Totally fun and I can't wait to add in my vacation photos & journaling. I packed up a few vintage storage items with my kit supplies. When I return from our road trip I'll have everything waiting for me. If I have enough space I'm hoping that I can fit our 2013 Colorado trip photos into this album too and just divide the two events with index labels or title pages. 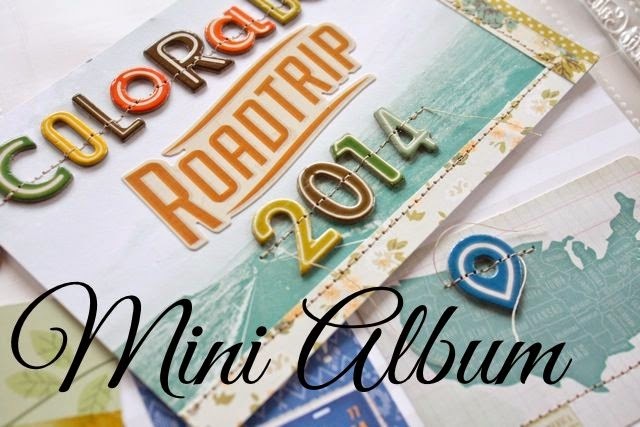 I'll be updating the blog with progress photos of my mini album so stay tuned. 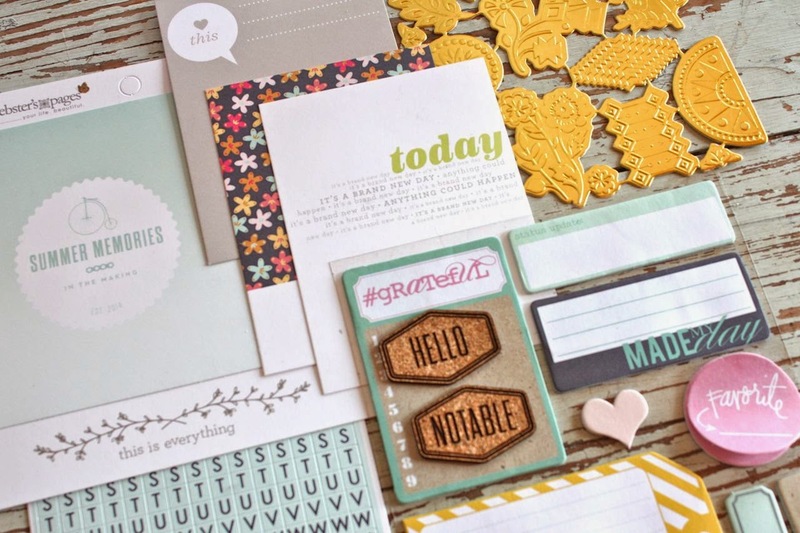 Be sure to shop the Gossamer Blue kits this month if you like the feel of this album. I'm so pleased with the selections in this month's kits. So, so perfect for my album theme. Are you headed out for vacation soon? I'd love to hear your plans for documenting your Summer trips.